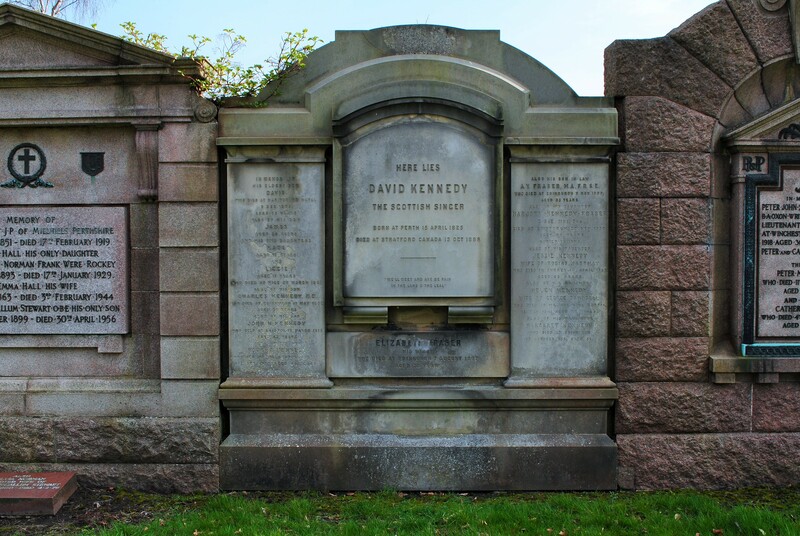 In Victorian times, David Kennedy was well known as a Scottish singer. Born in Perth in 1825, he initially trained as a house painter, even travelling to London to paint the ceiling of one of the rooms in Buckingham Palace. However, he had a great urge to be a singer, so, having taken lessons in singing and elocution in Edinburgh, he gave up his business to become a professional singer, specialising in Burns and traditional Scottish songs. He was 23 when he first embarked on a singing career, and by 1863, when he was in his mid thirties, he was successfully touring England and Scotland. Three years later he started on his first tour abroad, visiting Canada and the United States in a tour that lasted three and a half years. His life was then split between lengthy tours abroad and periods of living in Edinburgh, giving concerts within the British Isles. His foreign tours included visits to Australia, New Zealand, South Africa, India, and the United States several times. He died at the age of 61 in Stratford, Ontario, during a tour of Canada. David Kennedy married twice. In 1848 he married Helen Henderson, and they had three children: David, Robert and Helen. His wife, however, died after five years of marriage. In 1855 he married his second wife, Elizabeth Fraser, by whom he had eight more children. The eldest, James, was born in 1855, and the youngest, Jessie, in 1869. His family were very much part of his professional life, and as they grew up they joined him on his tours. Elizabeth accompanied him on many of his travels. The children, when young, were sent to boarding school. 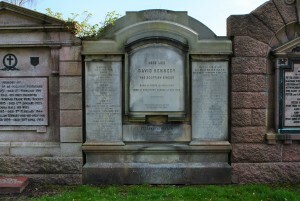 David Kennedy’s second wife Elizabeth (1827-1897) and all the children are commemorated on his monument. Son David Henderson Kennedy (1849-1883) did not enjoy good health. He worked as secretary to the Council of Education in Natal, South Africa, dying there at the age of 35. Robert (1852-1918) accompanied his father on several tours, studied singing in Italy, and died in Melbourne, Australia. Helen Agnes Kennedy (1854-1941) acted as her father’s piano accompanist from the age of 14. She married George Campbell and died in Halifax, Nova Scotia. James (1855-1881), Kate (1862-1881) and Lizzie (1864-1881) also studied singing in Italy. They all died in a fire in the Théâtre des Italiens, Nice, on 23 March 1881. Charles (1859-1909) became a doctor and died in Edinburgh. Margaret (1865-1951) died in Edinburgh. John (1867-1912) died in Bristol. Jessie (1869-1937) married Tobias Matthay, a professor at the Royal Academy of Music, and died in Midhurst, Surrey. Marjory (1857-1930) was his most famous daughter. She married Alfred Yule Fraser, her mother’s cousin, but he died at the age of 33, leaving her with two young daughters. As Marjory Kennedy-Fraser she collected and published Hebridean traditional songs. She also taught in Edinburgh. For her work, she was awarded a CBE and an honorary degree from Edinburgh University. She died in Edinburgh. Opposite David Kennedy’s grave, is a headstone (now fallen), which he dedicated to his father David (1800-1874), his mother Cathrine Taylor (1801-1857) and his sister Cathrine (1835-1891).